How was Abraham Lincoln veiwed in his own century—before two world wars, the Civil Rights movement, presidential impeachments, red states vs. blue, and 9/11? By reprising the first portion of John Morse's eloquent 1893 biography, we take you to Lincoln in his own time, and his unique place in the evolution of a country and its Constitution. "His day and generation uttered itself through him," wrote Morse—and the echoes are still heard in every succeeding American generation. Scroll down first to read excerpts from the text, and to see some of the original illustrations created for this Levenger Press collector's edition. Then click here and go to "More Photos" to see to see some of the newly digitized images of Lincoln's handwritten corrections to his first inaugural address. His chief trait all his life long was honesty of all kinds; honesty in language, in purpose, in thought; honesty of mind, so that he could never even practice the most tempting of all deceits, a deceit against himself. It was one of those periods in which small men are laid aside and great leaders are recognized by popular instinct; when the little band that is in deepest earnest becomes endowed with a force which compels the mass of careless, temporizing human-kind to gravitate towards it. He did what he could to give to the war a character far higher even than a war of patriotism, for he extended its meaning far beyond the age and the country of its occurrence, and made of it, not a war for the United States alone, but a war for humanity, a war for ages and peoples yet to come. Ungainly they saw him, but not undignified, and the strange impressive sadness seldom dwelt so strikingly upon his face as at this time, as though all the weight of misery, which the millions of his fellow citizens were to endure throughout the coming years, already burdened [his] soul. 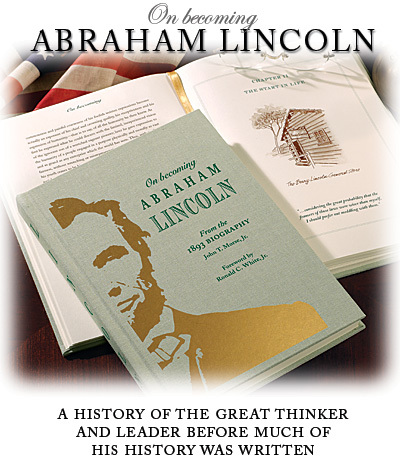 Excerpted from On Becoming Abraham Lincoln: From the 1893 Biography. © 2008 Levenger Press. Illustrations by Edward Barbini.